Satsuma Shochu Dining Bar is an izakaya* with more than 100 labels of of shochu** by the glass. Located on the premises of The Gallery Hotel at Robertson Quay, there are two seating options. On the first level, you will have a more casual and relaxing dining environment and be seated on tatami, while the second floor offer more formal dining environment with table and chairs. 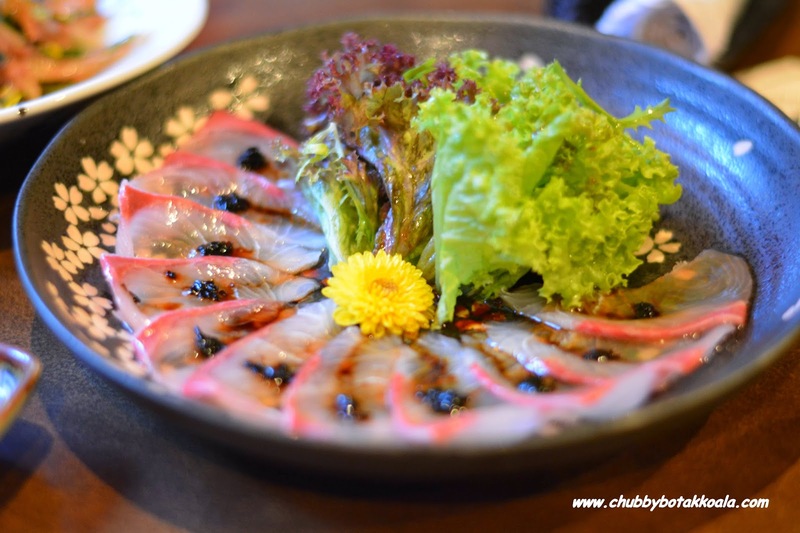 The décor of the restaurant is very casual, which is normal for izakaya type dining establishment, as in Japan. The most catchy decoration is the stack and stack of shochu bottles on offer. As the little devil and I are unable to consume alcohol at the moment, we stick with the food. While our two other dining companion, decided on take on the shochu. Their food are served in a small portion, which is more to accompany the drinks. Yellow Tail with Truffle Oil Dressing ($25) and Chicken Skin mixed with Cod Roe ($10) are our starters. The yellow tail is fresh with subtle sweetness, and the truffle oil dressing gives the taste another dimension. 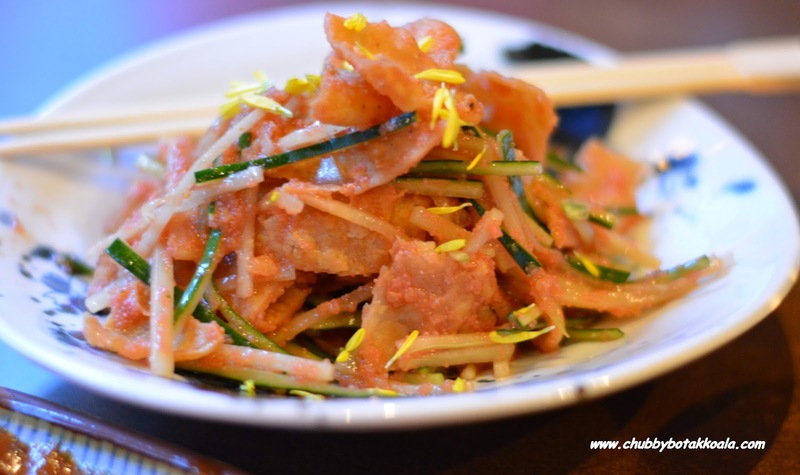 The Chicken skin salad is really an indulgence for chicken skin lover like myself, crispy deep fried chicken skins combine with fresh cucumber and coe roe to make you feel less guilty when you enjoy the yummyynesss!!!! For Kushiyaki – Grill items comes in a pair, we ordered:pork belly ($7), cheese rolled with pork ($5), asparagus rolled with pork ($7), quail eggs wrapped with pork ($6), ox tongue ($9), goose liver ($13), prawn with basil leaves and pork ($13), prawn with sweet miso sauce ($18), meat bar serve with raw egg ($6), Squid ($9), Sishamo (pregnant fish - $6), mushroom stuffed with mince chicken ($6). Most of the grill items are grilled to perfection. However, there are some items that you should not miss out on when you are here. 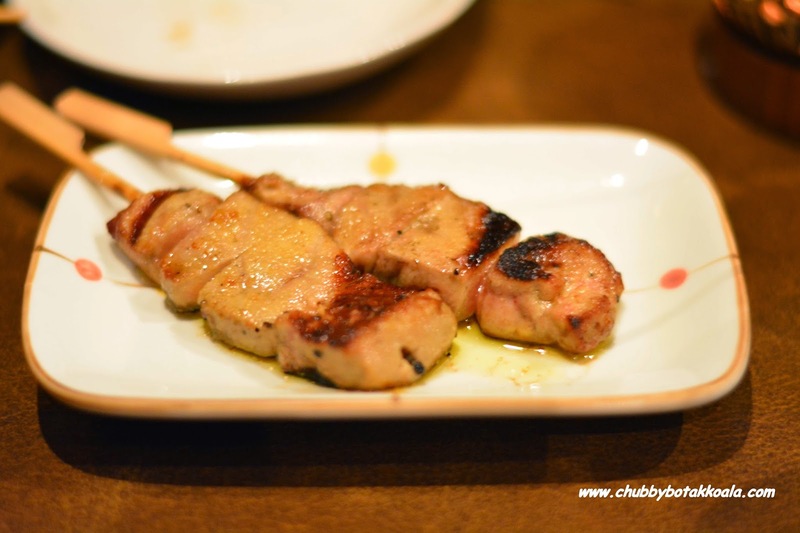 Goose Liver, crispy charred on the outside and melting soft on the inside. Prawn with miso sauce, fresh, tender juicy prawns topped with miso. Of course my favourite, pork belly; crispy, tender and juicy. 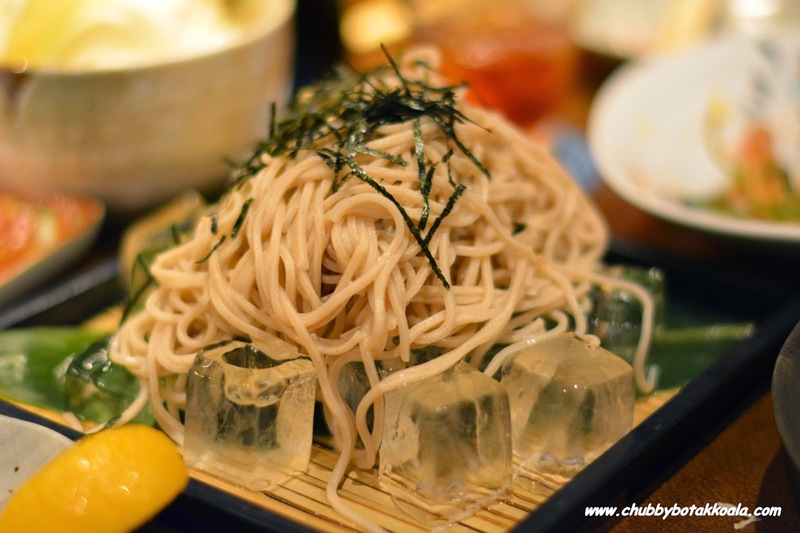 In case the petite dishes do not fill up your tummy, you can try their zaru soba ($12) and oyster omelette ($15). The soba is nicely al dante, while the omlette is generous in serving with tasty soy gravy. For the sweet tooth, you can try their Candied sweet potato ($10). Deep fried sweet potato, coated with liquid sugar. To satisfy those deserts cravings. Recommend serving for 2. Service is very attentive and good. The grill stuff might come a bit slow when the place is packed. 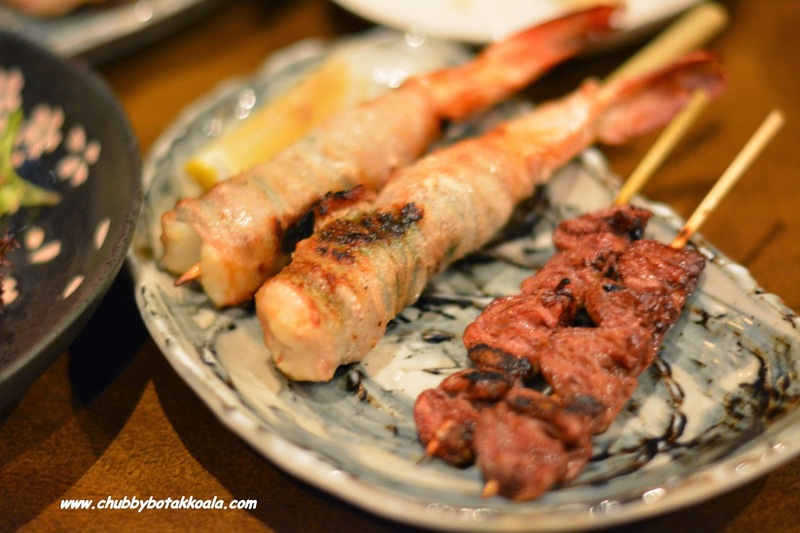 Overall, this place serve excellent authentic Kushiyaki to accompany the shochu. It is a good place to catch up with friends or entertain your clients. The best part, you can eat grill food and come out from the restaurant without smelling like the food itself. Cheers!! Closed on Sat & Sun Lunch.